Ever wish you could put your mind in the dishwasher? I know. It's a really weird question... When I first said this to a friend, she looked at me like I had finally lost it. That happens a lot to me, lol... surprised? Of course I didn't literally mean sticking your head in the dishwasher... but bare with me for a second. What I was trying to convey was that I felt my mind was so "gummed up" with negative and worrisome thoughts, all I wanted was for something that would just wipe the whole slate clean. A way to clear out all the gunk and get back to the bright, shiny, and happy feelings and thoughts. Just like a dish coming out of the dishwasher, all fresh, clear, and so much easier to fill with the positive and creative thoughts that I wanted to be having instead. Of course, once I explained this to my friend said she could relate... although, she had never thought of it quite like that and maintained that I must be a bit cracked. lol. I agree with her. You have to be a bit cracked - that's how the light gets in! The remainder of today's post looks at just how mindfulness meditation can help you clear and reset your mind. We are human... we worry, we get resentful, we are unsure what's wrong or how to fix it... we are get scared that everything isn't going to turn out, you know? We can't help but keep repeating the same thoughts over the same problems over and over and over.... and over. All these negative, fear-based thoughts bouncing around in our heads are robbing us of our peace of mind and happiness. I don't have enough time/energy/money to do the things I want to. I'll never be "good enough". We all know it's problematic. But what to do about it?! That is the question. First, recognize that it's a sign of strong self-awareness to get tired of repeating all those negative thoughts and noticing how much they control your energy and your day. If you look just a little closer, they are usually based in some form of fear. Somewhere, somehow, waaay down in there we're afraid of something. That's a given. Most of today's psychotherapy hinges on getting down into the dark and rooting around in the pain and suffering and fear until (hopefully) simply knowing what's in there will automatically make you feel better. It won't. If you stop there, you've missed the point. This is where so much psychotherapy gets de-railed for people, once "the assessment" is made, and that's it... as if now that you know what's wrong with you, your problem is solved. A diagnosis is just a label, awareness of a problem is just awareness, neither are the treatment. What I mean is, just because you are aware of something doesn't make it better... identifying the problem is not the real work of "bringing in the light" and healing one's thoughts. A good therapist can help you do this by offering support and direction through the process of becoming aware of and healing your thought patterns. They provide you with new perspectives on something like your MD provides you with medicine. New ideas about old experiences are the therapist's medicine. The work of healing habitual negative thought patterns takes vigilance and diligent application of positivity, compassion, and kindness. Directing these toward yourself first, and the the situation you're struggling with second. It means being present with it and processing it whenever you are triggered, even when you "don't feel like it" and would rather just watch TV or go to sleep or get a drink or buy this new "thing". Being present and doing the processing work around your thinking can be painfully emotional. That doesn't mean you get to skip this step, or run away from it... but you can get through it a little quicker! The most effective way I have found for my patients to "speed up" their mental healing is by encouraging them to learn the skill of mindfulness meditation. If you want to get past what's holding your back, you must have courage and step into the pain mindfully in order for it to heal. Mindfulness meditation helps by having you sit still, detach from your living your thoughts, and simply watch them without being squeamish or reactive. Somewhere in that process of sitting and focussing on something simple (like your breath), your mind gets calm enough that when negative thoughts cross your mind you don't automatically react to them anymore. 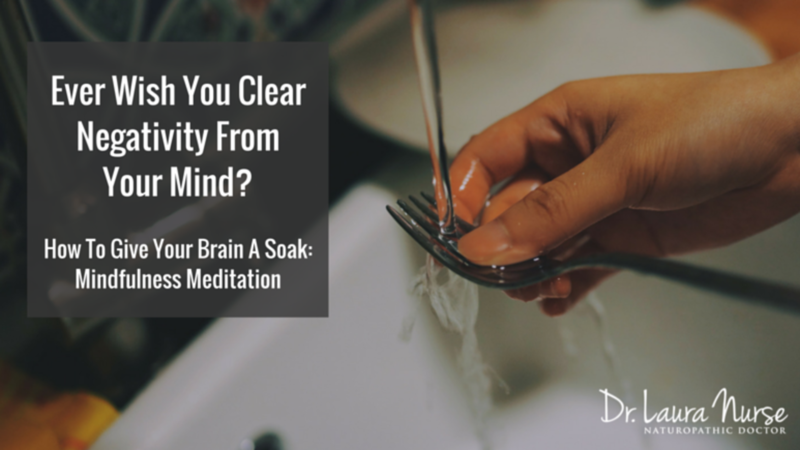 Just like when you are soaking a dirty pot, you start watching the gunky thoughts float up and when you don't actively pick it up and try to do something with/about it, it kind of just softens and floats off. You also notice it gets replaced by a another thought pretty quickly. After a while, you learn that you actually have some control over your state of mind. You learn that you can re-direct your thoughts by choosing what you focus on and react to. Practicing this non-reactive state allows you to give your mental will-power a healthy work out in an easy setting. Almost like building a mental muscle, so to speak. Before you know it, you'll be in the middle of your day and something will start to trigger you, and instead of reacting immediately, you fall into "meditation-mode" and just watch the thought pass without participating in it. Which allows the next thought (usually the happier of the two) to enter your mind. This is how you build the skill of being vigilant and diligent in your thinking. It teaches you the skill of being able to reign in your thoughts, and re-direct them. Allow me to end by saying that this is a life-long process. If you weren't struggling with learning something, I'd say you need to get out more! Did you like this post? Let's discuss! Did any of these ideas help shift your understanding of therapy? What ideas have you felt were medicine to your mind? Have you tried mindfulness meditation before? Leave a comment below, you never know when sharing your thoughts might help someone else! I'm honoured that you read all the way to the article, and so happy to continue sharing them with you if you find them helpful. If you do, let me know. If you don't, let me know what questions you do have and I will plan to answer them in a future post.